This is my first crack at the Kudos Pinot Noirs crafted by prominent Oregon winemaker Laurent Montalieu who seems to make wine for a hundred wineries. 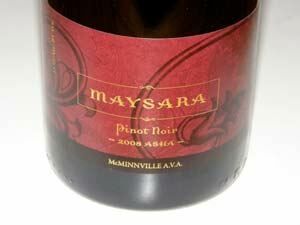 This was my first tasting of bottled 2010 Oregon Pinot Noir and I came away very impressed. Montalieu is a French ex-patriot who grew up on the Caribbean Island of Guadaloupe, but spent summers in his family’s home in Bordeaux, where he learned to grow grapes and make wine. 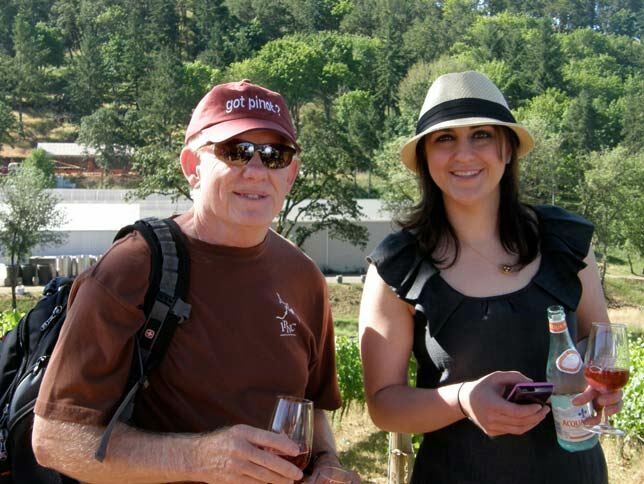 He has many projects in Oregon including his own label, Soléna, with his wife, Danielle Andrus Montalieu whose father, Gary Andrus, started Pine Ridge Winery when she was 10 years old, and who later founded Archery Summit in Oregon. The Montalieus founded Grand Cru Estates in the Yamhill-Carlton District, a winery where Soléna is crafted and members are allowed access to premium fruit and work one-on-one with the Montalieu and winemaker Tony rynders to craft their own Pinot Noir. The Montalieus are also part owners of NW Wine Company in McMinnville where Laurent crafts wine for several labels, and part owners of Hyland Vineyard and Estates. 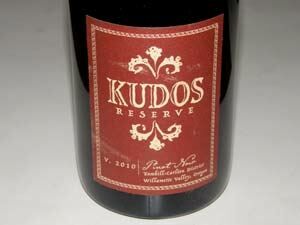 The Kudos wines are crafted at NW Wine Company. The brand has no website and the wines are sold through retail distribution channels including Whole Foods Markets. 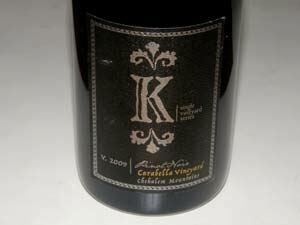 The wines are of very high quality considering the reasonably prices. They undergo a short period of barrel aging, are released early, and are intended for drinking upon release. 13.5% alc., pH 3.51, TA 0.62, 10,000 cases, $15. · Moderately light reddish-purple color in the glass. Pleasing aromas of strawberries and red cherries with grassy herbs and oak spice. 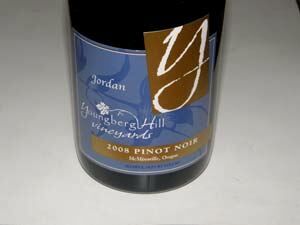 Relatively light red cherry and red raspberry fruit flavors with an underpinning of savory herbs. Crisp and tasty, with mild tannins and a lively acid backbone leading to an uplifting finish. A solid daily drinker. Good (+). 13.8% alc., pH 3.59, TA 0.54, 1,560 cases, $20. Aged 7 months in 15% new French oak barrels. A blend of vineyards. · Moderately dark reddish-purple color in the glass. Aromas of dark fruits, earth and oak. A middleweight offering of tasty black cherry, black raspberry and plum fruits with a very slight complimentary accent of oak char. The wine displays an earth and mineral foundation typical of this region. The fruit core makes an impression, the slightly grainy tannins are reined in, the mouth feel is satiny and seamless, and the wine finishes with bright acidity. Very good. 14.2% alc., pH 3.51, TA 0.59, 317 cases, $30. Aged 8 months in 22% new French oak barrels. · Moderately light reddish-purple color in the glass. Brooding aromas of dark red stone fruits, spice and oak. Impressive mid palate explosion of perfectly ripe red fruits wrapped in mild dry tannins, finishing with a striking intensity of cherry fruit. Very smooth in the mouth, with an ephemeral finishing tone. Very enjoyable wine at this price point. Very good (+). 13.7% alc., $30. · Moderately light reddish-purple hue in the glass. The nose is oak-driven with the scent of brewed coffee. On the palate the core of dark red and purple fruit is moderately dense and intense and offers an amazing persistence on the huge finish. There is more oak on board than I like, but this should moderate over time in the cellar. Very good. 13.8% alc., $30. · Moderately light reddish-purple color in the glass. Demure cherry aromas with prominent scents of hay, underbrush and oak. Herb-inflected strawberry and cherry flavors with an earthy oak background, mild tannins, decent acidity and a pleasing cherry finish. Soft, elegant and refined. Lacks the luscious fruit and structure of the 2010 bottling. Good (+). Moe and Flora Momtazi, who escaped from Iran on a motorcycle, made their way to Texas, and eventually Oregon, bought 532 acres of abandoned wheat farm in McMinnville. Starting from scratch, they began planting in March of 1998. Today, over 200 acres are planted. Farming has been holistic from the beginning employing strict organic and biodynamic methods. Both the vineyard and winery are Demeter Certified Biodynamic®, and the vineyard is now the largest biodynamically farmed vineyard in Oregon. Flora was pregnant with their daughter, Tahmiene (pictured below), when the couple fled from Iran, and today she is the winemaker for Maysara. The Momtazis story is an inspiring one of perseverance under the most challenging of circumstances. The wines are available for sale on the winery’s website. The winery’s tasting room is open Monday through Saturday. 13.7% alc., 8,722 cases, $25, screw cap. Jamsheed was an ancient Persian King able to peer into his wine chalice and glimpse his entire kingdom. Dijon and Pommard clone vines planted on a variety of soil tyhpes and elevations within the Momtazi Vineyard. Aged 11.5 months in 8% new French oak barrels. · Moderately light reddish-purple hue in the glass. Bright aromas of fresh pie cherries, strawberries, red rose petals, bay leaf and oak. Flavors of dark cherries, ripe strawberries and a hint of plum, anise and oak, supported by supple tannins and bright acidity. Soft in the mouth and easy to drink now. Very good (-). 13.8% alc., 919 cases, $32, screw cap. Clones 113, 114, 667, 777 and Pommard. Aged 12 months in 30% new French oak barrels. · Moderately light reddish-purple color in the glass. Very appealing aromas evolve with conviction on the nose which shows a perfume of dark red cherries and berries, dried herbs and complimentary oak. Mid weight flavors of perfectly ripe Bing cherries and raspberries wrapped in ripe fruit tannins with some persistence on the juicy finish. A refined and rounded wine that is very enjoyable. 13.5% alc., 580 cases, $39, screw cap. Aged 22 months in 40% new French oak barrels. · Medium reddish-purple color in the glass. Complex aromatic profile offering scents of dark cherries and berries, rose hips tea, potpourri and dark chocolate. Discreetly concentrated core of very ripe cherries, berries and plums with an undertone of brown spices and sassafras exhibiting a long, hi-strung, citric-laced finish. Should evolve beautifully over the next 5 to 10 years. Very good (+). A family owned eight room country inn owned set on a 50-acre hilltop surrounded by a 20-year-old estate organic vineyard. The vineyard encompasses 12 acres of Pinot Noir planted in 1989, 5 acres of Pinot Gris planted in 2007, and an additional 3 acres of Pinot Noir planted in 2008. The estate vineyard, located in the McMinnville AVA, is certified Live and Salmon Safe. The current proprietors, who had backgrounds in the wine and hospitality industry, purchased Youngberg Hill in 2003 and completely renovated the entire estate including viticulture practices, winemaking, the tasting room and hospitality. The winery’s tasting room is open daily from 11:00 AM to 5:00 PM. The estate is a popular site for weddings. 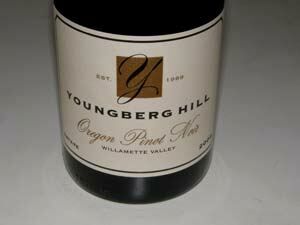 Visit the very informative website at www.youngberghill.com for more information and to purchase wines. 13.9% alc., pH 3.50, 412 cases, $20, screw cap. Clones are 40% Wädenswil and 60% Pommard. · Moderately light reddish-purple color in the glass. Aromas of wild red berries, cherries, red licorice, exotic wood and cut grass. Light bodied but with a flavorful core of slightly confected red fruits including cranberries and cherries with a hint of savory herbs. The finish offers a bright cut of acidity. A nicely composed wine that can stand on its on as an aperitif or work beautifully at the dinner table. Good (+). 14.0% alc., pH 3.60, 370 cases, $30. The Natasha’s Block sits on 6.6 acres facing southeast and receives the maximum amount of sunlight. 50% Wädenswil and 60% Pommard clones. · Moderate reddish-purple color in the glass. A deeply perfumed nose offering a thrust of dark berry aromas with hints of dried herbs, walnuts and cut flowers. Middleweight dark berry flavors with riffs of savory herbs and anise, making an impression on the mid palate and lingering with intensity on the long finish. Prominent tannins are well balanced by good acidity. 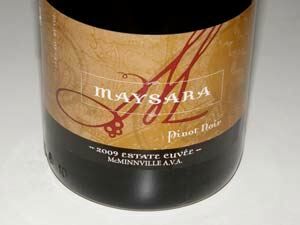 Like so many Pinot Noirs from the superb 2008 vintage in Oregon, this wine needs several years in the cellar to allow full integration of tannins and complete flavor development. This was demonstrated when a previously opened and re-corked bottle was tasted two days later and showed luscious fruit flavors with softer tannins and a velvety mouth feel.